Before we embark on our grand adventure, allow us to first set the scene, so you have an idea as to our personal history with the show. I grew up in the San Francisco Bay Area and, in the late 1960s and early 1970s, Saturday night was spent in front of a TV screen. 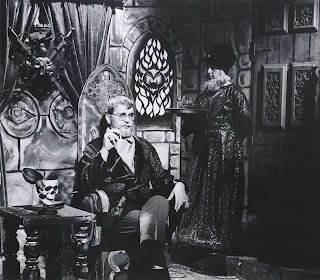 At the time, the Bay Area was rife with Double Feature Horror shows, hosted by The Ghoul, Bob Wilkins, and, in the case of Kemo’s Shock Theatre, Asmodeus. Not a ghoul, not a crazed beatnik, not a critter who splashed his way out of a bowl, Asmodeus was a well-dressed, elderly gentleman who may just have been the butler in any number of the horror castles featured prominently in the films he hosted. Asmodeus would grimly warn you that the movie you were about to watch might be great or might not be great. 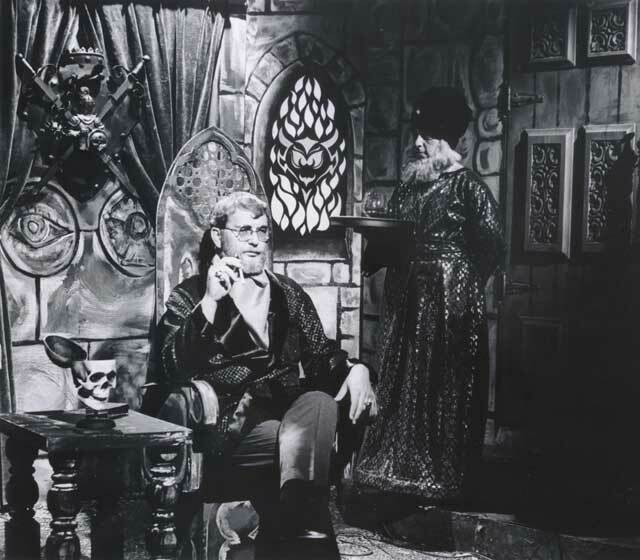 One Saturday night in 1971 (I remember it was in 1971 because in the other room my mom was watching a brand new show, causing quite a stir, called All in the Family) I caught Asmodeus hosting Boris Karloff in Mario Bava’s Black Sabbath. I was used to watching “horror films” like Frankenstein, The Wolfman, Horror of Party Beach, or Monster on the Campus. Cool films, not scary, populated by guys in monster suits. Here was something new, this Black Sabbath: three very scary stories with no monster suits, just monsters. That was when I first became aware of the charisma of Boris Karloff. After Sabbath I would seek out anything Karloff starred in. I never saw an episode of the legendary Thriller until Universal issued a set of 6 episodes on VHS in 1996. I had read a bit about the show in Famous Monsters of Filmland. It was supposedly the “most frightening TV show of all time,” one literally so scary that you might drop dead after one viewing. As far as I know, the show never saw syndication in the Bay Area during my childhood so I could only imagine how great a dramatization of my favorite short story, Robert Bloch’s “Yours Truly, Jack the Ripper” truly was (we’ll share that experience together in a few weeks). It was only after I discovered that monster movie journalism existed outside of Forry Ackerman’s playground that I learned more about this “pinnacle of TV terror.” 67 episodes of sheer terror and ghastly goings-on! The set of 6 VHS tapes (also available on laserdisc) included: “The Grim Reaper,” “Terror in Teakwood,” ”Incredible Doctor Markesan,” “The Premature Burial,” “Masquerade,” and “The Prediction.” By no means did these episodes represent the best of Thriller but they got me excited enough to tape the run off The Sci-Fi Channel a few years later and then (looks over his shoulder a couple times) to fork over a couple Andrew Jacksons for a grey market dvd set of questionable quality. It was then that I discovered that there were just as many (if not more) cow patties on this horror highway as there were gold nuggets. I think you’ll find that most of the chaff bookends the wheat. I too grew up in the Bay Area, a few years after Peter, but close enough that I was able to catch the tail end of the Bob Wilkins era of Creature Features, and the entirety of the John Stanley run. 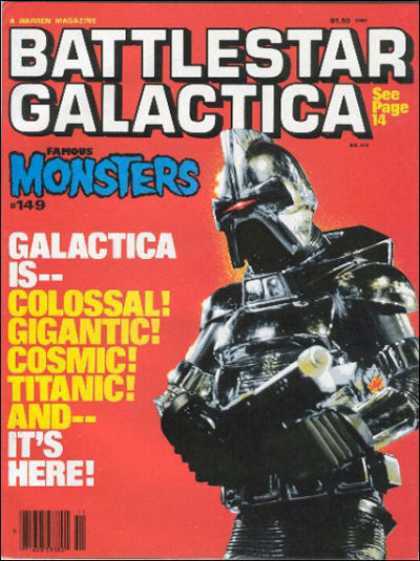 I was one of those kids who, in the days before VCRs (let alone DVRs), would go through the weekly TV Guide (for those of you who even remember what that was) to circle the monster movies coming on in the week ahead. 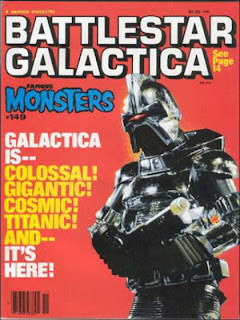 I also came to Famous Monsters quite late (innocently picking up what appeared to be a Battlestar Galactica magazine in the grocery store), but I had the same experience with it as those of the generation before me - it was a magazine created and written just for me. While I was aware of Boris Karloff from the movies I had seen and books in my collection (those well worn and profusely illustrated Dennis Gifford and Alan Frank volumes I also imagine most monster movie fans in the 70s grew up with), it was through FM that I developed a greater appreciation for the man, and awareness of his vast body of work. I think my first introduction to Thriller was in Stephen King's seminal Danse Macabre, in which he starts off by describing it as, "Probably the best horror series ever put on TV" (note that the marketing folks managed to drop the first word in the quote prominently featured on the DVD box). I was sure that Peter, in his advanced years, would have seen them all, and much to my surprise he had not. When the six episodes were released by Universal, I blindly dropped the big bucks for the LaserDisc set, and was not at all disappointed. The transfers were great, the shows were fun... and I was ready for more! For better or worse (definitely better for my wallet, at $100+ for six episodes), no further volumes were released. I did manage to pick up a filler set in the intervening years, unsure that we'd ever see a legitimate (let alone complete) release on DVD. Kudos to Image Entertainment for making this happen in such a grand fashion, and at what this viewer feels is a very reasonable price, particularly considering the extras. As I've only seen a handful of episodes beyond those original six, I can only hope that the majority meet or exceed my expectations! Hi guys! Well, I'm not only of the same vintage as you (b. 1966) but place as well (Bay Area). Actually, Thriller did have a brief run on Channel 40 ... but since it was a channel we didn't get, I never saw it. First heard of it when I got the book "Fantastic Television," then later Stephen King's rave in "Danse Macabre." Didn't actually see an episode till I bought a handful from Ken Kaffke in the 90's, then taped of the Sci Fi Channel, then a bootleg DVD set ... and now I'm a proud owner of the official DVD set. So I'll be watching your blog with interest. Yes, not all of "Thriller" is outstanding (though I think most of its weaker episodes aren't lousy - just unmemorable). Thanks for taking the time to write. Channel 40 was the "promised land" for those of us "monster kids" who grew up in San Jose. The TV Guide would promise great stuff like SCARS OF DRACULA but my goofy little aerial wouldn't pick up Sacramento channels. I didn't get 40 until Gill Cable invaded San Jose in the mid-70s and then that was the channel I tuned into. Bob Wilkins on two channels! I remember Kaffke. Still have a handful of his fanzines (WEIRD STUFF?). Just xeroxed articles from other magazines like FILMFAX. I've still got my "Official Thriller Fan Club" scroll around here somewhere. I hope you'll continue to comment as we lay waste to these early episodes! John, if you haven't already done so, check out my two-part blog post "Independents Days." It's kinda goofy, but in the same spirit as your on-target remarks about the pre-VCR era. You might like it. I had the snot scared out of me by THRILLER on the original network run. This set is the best thing that ever happened on DVD as far as I am concerned. This site is really nice and I plan on checking in a couple of times a week. Thanks guys!! And thank you, Mysto, for posting, and welcome to the blog. Glad to see you doing THRILLER reviews. I bought the series, and have been waiting for years for this on DVD. I have been enjoying them. I love that you remember and write about Asmodeus in your introduction. But I'm going to knock your memories slightly sideways. Asmodeus never showed BLACK SABBATH on Shock It To Me Theater. KBHK 44 owned the AIP catalog and aired them from the first week they began broadcasting in 1969. It's easy to mulch these memories, since the airwaves were swamped with monster movie shows at the time, and we were often switching between channels to check out other shows scheduled in the same time slot. The fact that the other film packages circulated between the stations certainly doesn't help matters. My memories actually matched yours as far as seeing BLACK SABBATH on Shock It To Me. A friend and I are writing about the various local monster movie shows (both hosted and unhosted) and creating a data base of the various movies and show times. Channel 44 aired BLACK SABBATH in January of 1971and again in July. It continued to pop up through the years as part of the KBHK Drive-In Movie, The Ghoul, and pretty much every other movie show on 44. Asmodeus was a class act. He was the first horror host I ever saw, putting him in the company of Sean Connery and The Beatles as defining influences in my life. Thank you again for bringing him into the conversation. Asmodeus was actually on the air a little less than a year. But he was the greatest practitioner of the classic horror hosting arts we had in the Bay Area. That sounds like a very cool and ambitious project! Are there plans to publish that in book form or online? What a great resource for local monster kids! I don't know how much data you've already gathered, but I'd love to find out the dates when Bob Wilkins aired Night of the Living Dead on Creature Features in order to pinpoint the first time I saw that. Bob first showed Night of the Living Dead on 01/01/1972. The film reappeared on Creature Features 11/11/72 and popped on the show numerous times after that. According to Wilkins and bob Shaw, the film was initially run uncut - or nearly so - and trimmed during re-showings due to general public concerns about violence on television. The project is coming out in print form a little later this year. It's called "Shock It To Me: The Featured Creatures of Bay Area TV". We cover everything from KRON's Nightmare program in 1957, with host Terrence (Russ Coglin) through the current Creepy KOFY Movie Time. We've got some photos of Terrence (Jr. and Sr) and Asmodeus that have never before been in print. That's kinda exciting for a horror host geek such as myself. KBHK's unhosted film shows are giving us some grief as they went under a number of different umbrella titles: Monstrous Movie, KBHK Drive IN, The World Beyond, The Ghoulie Movie, Shock Theater - and 44 rarely bothered to list them as such in the T listings. So it's often impossible to tell where one run ends and another begins. Occasionally you'll find a print ad in the TV Guide, but they were pretty stingy. They apparently never even bothered with a single print ad for The Ghoul. At least, we haven't been able to turn one up. The great thing about the local horror boom in the late 60s/early 70s was that - as you noted with the Planet of the Apes - you COULD switch from one movie to the next without a break. When channel 11 was showing horror blocks on their all-night movies, you could literally shock around the clock. If KBHK showed something like BOWERY BOYS MEET THE MONSTERS at 10am, you would have a nearly unbroken string of monsters on the various channels til 6am the next day. Amazing. Best of luck with this THRILLER project. I'm looking forward to digging deep into it. Sounds like two copies sold already. To an old-timer who was raised on Wilkins, The Ghoul, and Asmodeus, this sounds like a fabulous project. Are you self-publishing? Have you a website you can link us to for more details? As one of my late night friends (on 36?) used to say "Keep on a'hackin and a'hewin'!" Ah! J. Brown of Spartan Dodge, host of Night Owl Theater, with his little mascot "The Price Slasher", who was always "a'hackin' and a'hewin' at that dollar sign!" Yeah, he was on channel 36. I remember when they were running a slew of Warner Brothers gangster movies. Additional information on the book will eventually show up on the uhfnocturne.com website - which was really the initial inspiration for the book. We're self-publishing the first edition and focusing specifically on programs that aired in the San Francisco market. After that, we're planning to expand to a Northern California edition, and include Sacramento, San Jose and other areas of the valley. In the meantime, Lon (uhfnocturne) Hubar is translating the broadcast info into an electronic data base - which I believe will eventually be available on line. We interviewed a couple of the guys from KEMO, who revealed a book's worth of information in one sitting. An amazing amount of local broadcast history is centered on that little station. Once the first book is completed, I'm thinking seriously about doing an all-encompassing piece on channel 20. If so, I suspect that would be a multi-chapter on line project. I'll restrain myself at the moment from blathering philosophically about the power of local television. But for anyone who grew up with it, the effect and lasting influence is obvious. I note that ME TV is now showing 2 Thriller Episodes on Sunday starting at 9:00 pm CST. I would also note that in my area ME TV is now showing an episode weeknights at 2:00 am CST and Sunday's at 10:00 pm. Tonight I watched "The Merriweather File".and really enjoyed it. I also have enjoyed my first visit to your site and will return for more.